UPDATE: The issue seems to have been resolved in DisplayLink Core Software version 7.9.1336.0. It might have been fixed in earlier version but I have tested only 7.9.1336.0. Recently, I upgraded my laptop to Windows 10 and Office 2016. For keeping tabs on the setup, I have installed Office 2016 from my Office 365 account and the version is 16.0.6001.1038 (later updated to 16.0.6001.1043). This click-to-run version seems to be latest available as of this writing. 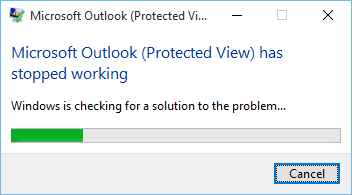 Outlook complained that Microsoft Outlook (Protected View) has stopped working. I also noticed that in Outlook preview pane it reported “this file cannot be previewed because the previewer has been disabled”. This seemed to be limited to Office documents (Word, PowerPoint) as I was able to preview PDF files without any errors. Microsoft explains this protective behavior in this article: http://windows.microsoft.com/en-US/internet-explorer/download-files#ie=ie-11. I am sure there are ways to override this default behavior, but since it would make your PC less secure, I would rather not teach you how to shoot yourselves in your foot. Better safe than sorry! As you may have guessed already, the solution was simple. 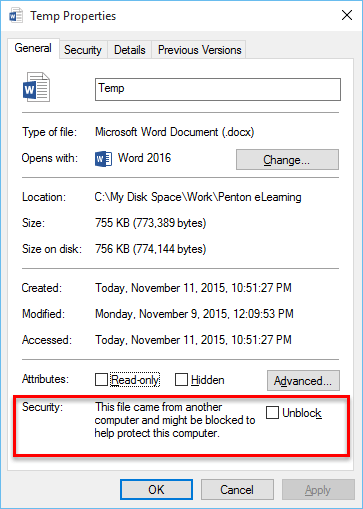 Since I trusted the sender, I unblocked the file and Word opened the file happily. Sadly, I decided to live with broken preview experience in Outlook until I can get the previewer to succesfully open attachments in protected view. I didn’t want to disable protected view as that would compromise security of my setup. I was asked to try disabling hardware acceleration in Office programs, which I tried, but that didn’t fix the issue. What was worse is, I was unable to open Office documents (mainly PowerPoint files) from my SharePoint library! 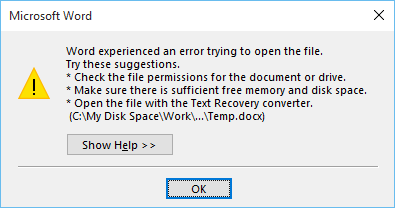 Unless I copied the files to my local disk (not simply opening the document from synced library) and open it, it refused to open the document, citing errors as if the document was corrupt, which wasn’t true as I was able to open the document in browser. Painful as it is, I not only experienced this issue on one, but two of my laptops! Now it was bugging me more than it should! On my brand new Surface Pro 4, right after installing Office and nothing else (no additional plugins, no other third party programs etc. ), I was still experiencing the problem. I even reset my Surface to factory default image (talk about painful and time consuming!) and tried installing Office from ISO image instead of my Office365 subscription (Click to Run version). Something caught my eye as I was going through this setup. It was late at night and I chose to sit in more comfortable sofa instead of my usual home office. Right after installing Office from ISO, I noticed that I was able to open attachments! This was before I applied the latest Office updates. Now I started wondering whether the issue was not using my sofa or the latest Office updates. As you can imagine, I quickly ruled out my sofa. I took a brave step of applying latest Office updates which brought my office version to 16.0.6001.1043. To my surprise though, latest Office updates did not break the functionality either! I was able to preview attachments in Outlook and I was able to open documents from SharePoint libraries! Can it really be my sofa! I mean really, how stupid would that be! But then it clicked. My sofa did not have Targus USB 3.0 docking station ACP71USZ but my home office did! Since I did not have the dock on sofa, I had not installed the drivers after resetting my Surface to fresh OS install. And everything was working as expected. Now, I went to town, installing all my required software including third-party bits. And I was still able to open attachment preview in Outlook and open documents from my SharePoint libraries. Now it was obvious. I took my Surface to my home office and attached it to the Targus USB 3.0 Dock. The drivers installed automatically and I rebooted the Surface after drivers installed. Do you want to guess what happened next? Yes! I was unable to open attachment preview in Outlook and was unable to open documents from SharePoint libraries! Simply undocking my Surface did not solve the issue either. I literally had to remove “DisplayLink Core Software” which was version 7.9.630.0 at the time of this writing. And after removing it, all problems were gone! I guess I should be working more from that comfy sofa than my elaborate home office setup! Or replace that Targus dock with something functional. Don’t get me wrong, the Targus dock has served me well over past couple of years. However, the new driver along with Windows 10, is a deal breaker. And I love Windows 10 so the dock has to go. I suppose I can wait for driver fix from DisplayLink. But then again, Microsoft Surface users have been waiting for wireless fix (where slow speeds rule and 2.4 GHz networks are preferred unless you force the marvelous “Marvell AVASTAR Wireless-AC Network Controller” to use 5GHz band only, which has its own issues for mobile professionals like me!) since release of Surface 3. The issue persists on Surface Pro 4 as well! So I wouldn’t risk holding my breath for DisplayLink or Microsoft fixing this compatibility issues anytime soon. The exact same issue has happened to me in the last week. Look forward to any solutions you can provide. I also came across the same problem and was unable to find a fix for it on the internet so after a while I was able to resolve the issue by Disable Protected View for Outlook attachments. I was coming across the same problem and found that if you “Disable Protected View” for Outlook attachments in Word and Excel it corrected the problem. I don’t like disabling protected view as it really disabled the protection I wish to have. It may be a Band-Aid but isn’t a solution for me. My issue turned out to be DisplayLink driver. Maybe something similar is causing your issue. I am having this issue as well. In fact, documents I create and send cannot be opened from on the email I sent. If I copy myself on an email with an attachment from myself, Word and other programs will not open the file – even though I created the file. This affected me as well. I think the DisplayLink driver is was installed automatically when I plugged in an external Monitor. This is fixed in latest version, check my update on the blog post. Hey, got it working on SP4. Uninstalled display link driver and installed latest Feb Display link driver from their website. seems to have fixed the issue with word documents previously failing to open and download.